How do we as heritage organizations interact with our society and with our LGBTI communities? How do we build relationships with owners of the archival material, how do we engender trust in our institutions as the place to store the memory? There is not a single answer to these questions, but I would like to provide a perspective on the power of a community advisory board/committee to an organization as they think about the questions. We have many organizational structures among us. For the sake of brevity and clarity, I will address the benefits and challenges I have experienced at a collection within a large University and encourage you to translate this in ways that make sense to your circumstances. For 30 years I have collected LGBT materials. 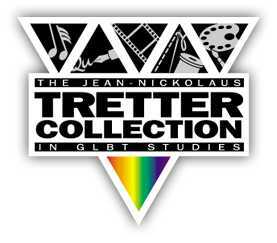 For 12 years I have been a Board member for the Tretter Collection in GLBT Studies. For 3 years I have had the archive in my will as a beneficiary. And for 5 months I have been the staff person for the archive. Do not underestimate the power of a community advisory board as a recruitment tool! When Jean-Nickolaus Tretter moved his personal collection into the University of Minnesota Libraries in 2000, he did so with caution. The University has over 50,000 students on the main campus alone. The Libraries have over 7 million combined volumes and serve over 2 million clients every year. As part of the department of Archives and Special Collections, the Tretter Collection joined a diverse group that includes Children’s Literature, Rare Books, Sherlock Holmes, Performing Arts, African American Literature and dozens of others. The Collection had grown beyond what Jean was capable of storing and the University had resources to help preserve and grow the archive while also making it more accessible. But would this large institution be supportive of a GLBT archive? Would a promising relationship continue into the future? From day one, the Tretter Collection was envisioned with a strong Community Advisory Board. I know that the Advisory Board has dramatically impacted my relationship with the Collection. It is not an exaggeration to say it is what brought me here today. I also believe it is the foundation of the strong and beneficial relationship we currently enjoy with the University of Minnesota. The Collection is part of the University of Minnesota, so the Advisory Board does not have the kinds of responsibility or control that a Board of Directors would have over financial, staffing and other decisions. It does have two key functions. First, the Advisory Committee serves to connect the Collection to the community. And second, the Advisory Committee is a built in advocacy group that holds the University accountable for their stewardship of the Collection and promotes the Collection to the broader community. The Tretter Collection is constantly working to build awareness and relationships both on campus and in the community. We need both kinds of relationships to meet our mission. Strong campus relationships promote use by students and faculty, and establish a strong rationale for University support. Among the members of the Advisory Board we seek faculty members and by rule, we include the staff person for the GLBTA Programs Office (the campus body working to improve the campus climate for GLBT students and staff). Strong community relationships are also crucial, as the community is an important source of financial support and one of our best resources for donations of materials. The Advisory Committee is a natural fit for people who have collections and are interested in the legacy they leave and the preservation of their materials. Inviting collectors to serve on the Board increases their understanding and commitment to the archive and is one of our best solicitation techniques. We have strong board members who have committed to gift both archival collections and financial resources. These members have a passionate interest in the success of the Collection. They also provide tangible evidence to the University of the value of the Collection and the benefits of maintaining a vital archive. The Tretter Collection is fortunate to have one paid staff person. But there is work for many more and no organization can afford to hire enough staff to reflect the full diversity of the LGBTI community. A diverse and representative Advisory Committee is an excellent way to bring in expertise from all parts of the community. We are constantly seeking to expand our membership into areas of the LGBTI community that we are under representing. Diversity in our community can mean a lot of different things. The Tretter Collection has been fortunate to have strong Board participation from undergraduates to doctoral level scholars. This has enriched the representation across generations and helped connect us with our University student users. We have also been fortunate to have strong participation from the transgender community and some communities of color. Beyond the usual diversity categories, many of us would also benefit from skills and knowledge, such as fundraising, corporate connections and the ability to produce a newsletter. Asking community members with these skills to join the Board can be an excellent overture. Our experience has been that sometimes they join. Others have offered to help with their skill set but have chosen not to formalize their role with a Board position. And others have been honored to be asked but have politely declined. The Tretter Advisory Board has had some strong successes. The Board has helped defend the collection against a decision by the University that was not in the best interest of the Collection. Several Board members participated in a hiring process that resulted in a much more supportive leader being hired by the University Library. The Board has advocated for and helped gain funding. Members watch catalogues and auctions and recommend materials for acquisition and have organized fundraisers and public exhibits. Board members help host the annual history display at the Pride festival. They submit articles for the newsletter. And on occasion we have had work days with the Board helping sort, process and re-shelve the Collection. A permanent Board may not be the best fit for every organizational need. In cooperation with the Quatrefoil Library, the Tretter Collection co-hosted the first GLBT ALMS Conference in Minneapolis in 2006. We knew that would be a very intense task, so we established a conference planning committee with representatives of both organizations. Although the committee disbanded with the end of the conference, the relationships developed during this process continue to form a strong collaborative partnership to this day. The formation of an Advisory Board can be modified in many ways to meet the needs of a specific organization. New and emerging organizations may benefit from having the name of a community leader(s) on an Advisory Board. Existing organizations that are perceived as being shut off from parts of the LGBTI community can gain new skills and new standing by recruiting in areas they have not yet reached. Those within large institutions might benefit from strong advocates to help promote the organization both internally and in the community. And those with independent Boards of Directors might be able to use an Advisory Board to engage those who support the organization but have no interest managing the organization in the formal capacity. None of this is to say that Advisory Boards solve all of our problems. Or even that maintaining them are always easy. Anyone who has worked with volunteers knows that there are challenges. And failing to manage these relationships well can damage the reputation of the organization and be worse than not doing it at all. Among the challenges: not everyone wants to commit the time required to serve on a board; some segments of the community can be very hard to draw into volunteer positions; a lot of us are more interested in collecting than raising the money to pay for the acquisitions; and some people simply don’t play well with others. As I shift from volunteer Board member to the staff role, I am re-assessing the work of the Board. We are facing an organizational transition with the retirement of our founder and the remaining original board members beginning to step away. We have strong new community and University members and I will be working on proactive ways to keep them engaged and take full advantage of their expertise. So, to return to the original questions of how we as heritage organizations: interact with our society; build relationships with owners of archival material; and engender trust in our institutions as the place to store memory? With proper investment, Community Advisory Boards have the potential to be a strategy towards each of these goals. They can be a tool for engagement, for donor solicitation and for accountability and trust building. I look forward to the LGBTI ALMS conference as an opportunity to hear from my colleagues about creative strategies they have used with Advisory Boards and Committees.